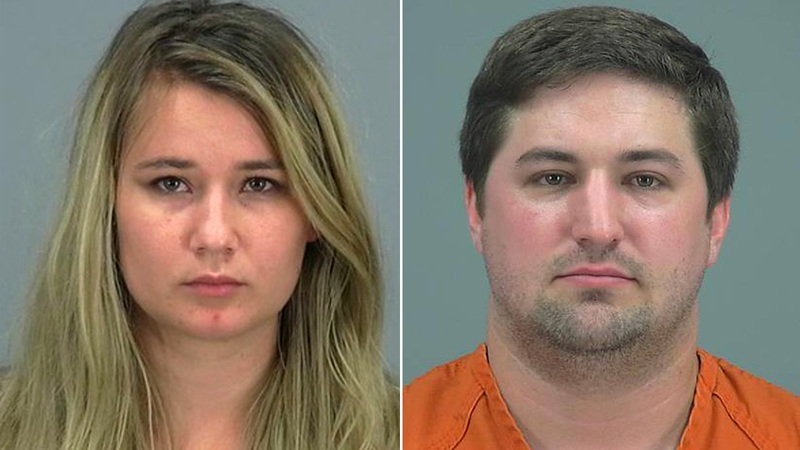 Brianne Daley (left) and Brent Daley (right) were arrested after authorities said the couple abandoned their toddler to go play 'Pokemon Go' in San Tan Valley, Ariz.
SAN TAN VALLEY, Arizona -- A couple in Arizona was arrested after authorities said they abandoned their 2-year-old son to go play "Pokemon Go." The Pinal County Sheriff's Office said it received a call about a 2-year-old boy being found outside a home in San Tan Valley, Arizona, at about 10:30 p.m. on Thursday. Deputies said a neighbor spotted the boy outside the home and knocked on the door, but stated no one was there. When deputies arrived, they said the boy was crying and trying to get back inside the home. The sheriff's office said the child was barefoot and only had a diaper and T-shirt on. Deputies went inside the unlocked home and confirmed through family photos that the boy lived at the house. A deputy found a phone number that appeared to be for the child's father, 27-year-old Brent Daley. When authorities called the number and told the man his child was found abandoned, they stated Brent Daley replied, "Whatever," and hung up the phone. About an hour after deputies responded to the scene, they said Brent Daley and his wife, 25-year-old Brianne Daley, returned to the home. The sheriff's office said the couple originally stated they were out getting gas for their car and they left the boy while he was sleeping. Authorities said the couple later admitted they were out playing "Pokemon Go" for more than 90 minutes as they drove around San Tan Valley, stopping at parks and other places to play the game. "Our agency and many other law enforcement agencies have been warning people about personal safety while playing this interactive smartphone game, but we never would have imagined that parents would abandon a child to play 'Pokemon Go.' This goes beyond comprehension," Pinal County Sheriff Paul Babeu said in a release from the sheriff's office. Both parents were arrested for child neglect and endangerment, according to the sheriff's office. Deputies said the child was placed into the custody of the department of child services.